Not the sound you ever want to hear from your guitar! Well, it’s been an interesting few weeks to say the least. Man, I was truckin’ along (yes, I’m older) with my BluesGrass, 80’s riff induced version of “Amazing Grace” and on the last day of rehearsing some final changes, it happened. In my enthusiasm of the sound of the Hymn I got up fast from the couch and started to hold my guitar high in an old stage move I did when I was on the road and “Whack”…. time stood still….that was really stupid Rhon….what were you thinking? I had banged the back of my guitar with my knee. “Well dude, you really did it now”, I mentally beat up on myself for what seemed like an eternity and I looked it over and to my surprise didn’t notice any visible signs of damage. Well, that’s a relief. So on I went and recording was tomorrow, so I thought I was good. The next day I recorded a few takes and got a good one only to hear some distortion right at the end of the track. Hmm, wonder if I just had to much signal? I listened back, pulled down the fader and there it was…the thing I’d craved for all my guitars when I was 12 years old…Distortion!…but, this wasn’t the type of distortion I wanted any part of. It was just plain hideous. Now what? Some things work themselves out in the long run and the plans we make don’t always turn out the way we wanted. Honestly, as a Christian I know this and need to be humble to it, but as an “A” personality and “let’s get it done” type, I thought I had done something wrong or God was shutting me down. That’s the problem with my way before His way. So after a bath in frustration I forged on. I had purchased some digital samples back in November of ’17 and had been wanting to get to this sound called the “Soft Piano” or “Felt Piano”. This was my chance! It is the most beautiful piano I’ve played. I got it loaded into the computer and upon the first chord played I was transported into the happy place I haven’t been in quite some time sonically. I played for about 20 seconds and there it was….my next single. It had a childlike sound with a very intimate character, which just happened to tie into a Bible reading I’d had a couple days before when Jesus said ” Truly I tell you, anyone who will not receive the kingdom of God like a little child will never enter it.” Perfect! And it reaffirmed for me that I must do my best to please my Father in Heaven especially when things don’t go as planned. Yes, easier said than done but this has become my next offering. I would love to hear your stories of “Plan B” and how it shaped your relationship with Him. I will be posting more video and updates until release of this very unique and intimate song. As always, may my words and notes be a blessing to you! Please share, subscribe, and follow along . Announcing my latest Single for the ongoing project #HymnsForSoloAcousticGuitar is now available! “Abide With Me” is now on iTunes, Amazon, Spotify, Apple Music, and all other major music retailers. There are links below to listen, purchase, and share or you can Click this link – Newsletter – for the story behind this release as well as artwork and more. I pray that this release is a blessing to you! One week from today my 2nd release for #HymnsForSoloAcousticGuitar will be available worldwide! The 2nd release is “Abide With Me” and will feature a stark guitar tuning that weaves through an emotional ride of several styles. This Hymn is a standard song that speaks truth and peace to the soul and I am very excited about this version. I have included the Artwork for this release in this Blog Post so be on the lookout for this picture one week from today. All my Newsletter subscribers get all release details, videos, artwork, and more before Social Media. You can sign up here Newsletter Sign Up to get the Newsletter delivered to your email inbox so sign up today! Your prayers of blessing for this release are appreciated! A man, a guitar, and a Hymn. A simple combination that came to fruition with the first sharing of “According To Thy Gracious Word”, a Hymn For Solo Acoustic Guitar. It was my honor and privilege to play my first release of the ongoing project #HymnsForSoloAcoustic guitar at the Presbyterian Chapel of The Lakes in Angola Indiana. This was the first sharing of the first of these Hymns live and apropros that it should be done at the place that it all started! The Hymn was played in both the morning service and the second service in the old Crooked Lake Schoolhouse where the idea for this project began. It was great to play “Live” again, especially in God’s house! One of the great things about this day wasn’t that it was 33 degrees and snowing outside, or that the only thing heating the little Chapel/Schoolhouse was a very stoked wood burning fireplace, it was that is was just real. People gathered to hear God’s word and worship and me to share the gift He gave me with just an Acoustic guitar. Simple. As the old acronym states – K.I.S.S. = Keep It Simple Stupid. 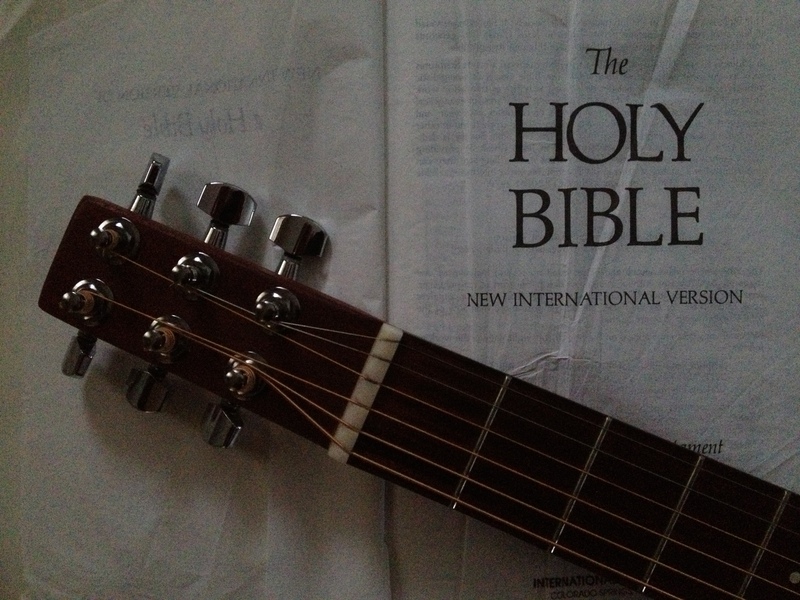 Like, just a Hymn and an Acoustic guitar. Not a chart topper on the Billboard Hot 100 but a place of peace to concentrate on things eternal. I will be doing just one more sharing of this first Hymn over the Holidays and then releasing the second Hymn “Abide With Me” with more special music dates to come in 2018! If you know of a Church that would like to sponsor me to come play my guitar and share this story please contact me at rockin@rhonvanerman.com . In the meantime please share this blog and your playlists on iTunes Music, Spotify, and wherever else you play these Hymns with your family and friends. My hope is not only that this project gives a place of peace from the chaos but also reaches those who need to hear it at just the right time! Today is Release Day! My first “Hymn For Solo Acoustic Guitar” is available digitally at all major retailers and streaming services. This is a day I’ve been looking very forward to because of one of the great benefits of this release is – Peace from the chaos. In a time where we have busied ourselves with whatever we can crunch into 24 hours that seems important at the time, we are losing one of the most important things to our health, well being, and eternity – Quiet Time. It it my hope that the Hymn “According To Thy Gracious Word” will make you pause even for 2:40 of your life to reflect, reset, and focus on what’s most important. Even though music is what I do for a living, the power of these great old Hymns has been very moving in their creation. A time of purpose, re-dedication, and taking in what is now. Let me know how this song blesses you. You can email me at rockin@rhonvanerman.com. There will be a “Behind The Music” video soon and more releases in the coming months. There are links below to some of the major digital retailers and Spotify. Other companies will be added in the coming days. As always, thanks for listening and supporting my music! Yep, that’s a hashtag. A virtual way of following all the releases, videos, photos, and more for the singles I’m about to release digitally. I’ve even started a special page on my website dedicated to this release here – Hymns For Solo Acoustic Guitar. So we’ll call this a virtual CD. There will be new Hymns released about every 60 days or less in an ongoing project that I hope will add peace, clarity, and a fresh listening experience for you! Please bookmark, share on social media, and add these songs to your playlists on Spotify, Apple Music, Pandora, and more! And if you’re a bit nostalgic, you can buy each track too! I will be creating a video soon about the story behind this project. The first Hymn will be “According To Thy Gracious Word”. A hymn that we sing A Capella quite often at Presbyterian Chapel of The Lakes Church. The guitar is tuned differently to give a Celtic drone with the melody being played at the same time. The dynamic starts low and builds to the 3rd verse with an intimate verse 4 that builds to a harmonic peak. It was quite cool to arrange! The release date for this first Hymn is Thursday November, 2nd and will be available on all digital retailers and streaming services. One of the unique qualities about this adventure is I’m doing it all from start to finish. Like cooking from scratch. The arranging, recording, mastering, artwork, copyrighting, licensing, upload, and PR! (I’m tired already!) Not so I can wave my flag, and not only to keep costs to a minimum (although that’s awesome! ), it keeps everything real, like it is in Church when we sing it, or when I sit back in the Lazy-Boy and put in my earbuds to just listen and get two minutes and thirty-nine seconds of peace! This allows me to be even closer to God because I’m laying everything in His hands on these releases. That…is the place I need to be! As always thanks for reading and listening and blessings to you! Today is the day. The day that we call Good Friday. A day to be quiet and remember. Remember what The Cross is all about and my reaction to it. I am posting the Official video of In The Quiet because this is the day the notes were written for. To take time today to reflect on the crucifixion in a quiet place. The inner me, my Spirit. May it be a blessing to you!